116 teams entered the 1990 World Cup, including Italy as host nation and Argentina as reigning World Cup champions, who were both granted automatic qualification. Thus, the remaining 22 finals places were divided among the continental confederations, with 114 initially entering the qualification competition. Due to rejected entries and withdrawals, 103 teams eventually participated in the qualifying stages. Thirteen places were contested by UEFA teams (Europe), two by CONMEBOL teams (South America), two by CAF teams (Africa), two by AFC teams (Asia), and two by CONCACAF teams (North and Central America and Caribbean). The remaining place was decided by a play-off between a CONMEBOL team and a team from the OFC (Oceania). Both Mexico and Chile were disqualified during the qualification process; the former for fielding an overage player in a prior youth tournament, the latter after goalkeeper Roberto Rojas faked injury from a firework thrown from the stands, which caused the match to be abandoned. Chile were also banned from the 1994 qualifiers for this offence. Three teams qualified for the first time: Costa Rica, the Republic of Ireland and the United Arab Emirates. The tournament generated a record low goals-per-game average and a then-record of 16 red cards were handed out. In the knockout stage, many teams played defensively for 120 minutes, with the intention of trying their luck in the penalty shoot-out, rather than risk going forward. Two exceptions were the eventual champions West Germany and hosts Italy, the only teams to win three of their four knockout matches in normal time. There were four penalty shoot-outs, a record subsequently equalled in the 2006 and 2014 tournaments. Eight matches went to extra time, a record equalled in the 2014 tournament. Ireland and Argentina were prime examples of this trend of cautious defensive play; the Irish scored just twice in five games in drawing all their matches until their defeat to Italy in the quarter-finals. Losing finalists Argentina, meanwhile, scored only five goals in the entire tournament (a record low for a finalist). Argentina also became the first (and so far only) team to advance twice on penalty shoot-outs and the first team to fail to score and have a player sent off in a World Cup final. Largely as a result of this trend FIFA introduced the back-pass rule in time for the 1994 tournament to make it harder for teams to time-waste by repeatedly passing the ball back for their goalkeepers to pick up. Three, rather than two points would be awarded for victories at future tournaments to help further encourage attacking play. Cameroon reached the quarter-finals, where they were narrowly defeated by England. They opened the tournament with a shock victory over reigning champions Argentina, before topping the group ahead of them, Romania and European Championship runners-up the Soviet Union. 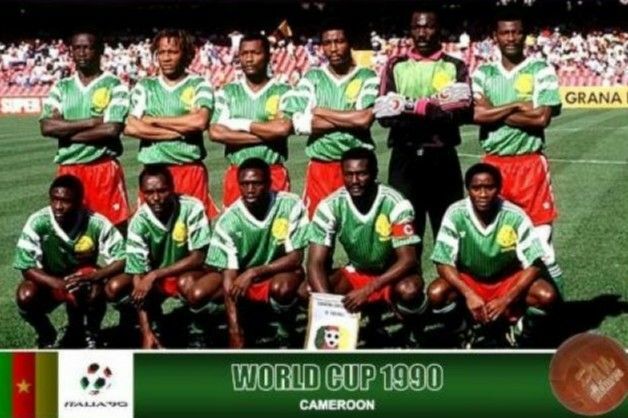 Their success was fired by the goals of Roger Milla, a 38-year-old forward who came out of international retirement to join the national squad at the last moment after a personal request from Cameroonian President Paul Biya. 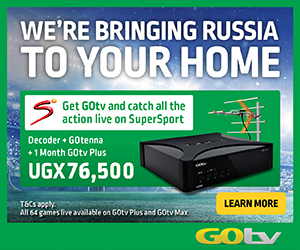 Milla’s four goals and flamboyant goal celebrations made him one of the tournament’s biggest stars as well as taking Cameroon to the last eight. Most of Cameroon’s squad was made up of players who played in France’s premier football league, Ligue 1- French is one of the officially spoken languages in Cameroon, it being a former French territory. In reaching this stage, they had gone further than any African nation had ever managed in a World Cup before; a feat only equalled twice since (by Senegal in 2002 and Ghana in 2010). Their success was African football’s biggest yet on the world stage and FIFA subsequently decided to allocate the CAF qualifying zone an additional place for the next World Cup tournament. Despite the performances of nations such as Cameroon, Colombia, Ireland, Romania and Costa Rica, the semi-finalists consisted of Argentina, England, Italy and West Germany, all previous World Cup winners, with a total of eight previous titles between them. After the 1970 tournament, this is only the second time in the history of the World Cup this has occurred. The teams which finished first, second and third had also contested both the two previous World Cup Finals between themselves. Two of the ties – Brazil vs Argentina and Italy vs Uruguay – pitted former champion countries against each other and West Germany met the Netherlands in a rematch of the 1974 World Cup. The all-South American game was won for Argentina by a goal from Claudio Caniggia with 10 minutes remaining after a run through the Brazilian defence by Diego Maradona and an outstanding performance from their goalkeeper Sergio Goycochea. It would later come to light that Branco had been offered water spiked with tranquillisers by Maradona and Ricardo Guisti during half time, to slow him down in the second half. Initially discredited by the press, Branco would be publicly proven right years later, when Maradona confessed the episode in a TV show in Argentina. As for Italy, a strong second half showing saw the hosts beat Uruguay 2–0, thanks to another goal from Schillaci and one from Aldo Serena. The match between West Germany and the Netherlands was held in Milan, and both sides featured several notable players from the two Milanese clubs (Germans Andreas Brehme, Lothar Mathaus and Jurgrn Klinsmann for Internazionale, and Dutchmen Marco Van Basten, Ruud Gullit and Frank Rijkaard for Milan). After 22 minutes Rudi Voller and Rijkaard were both dismissed after a number of incidents (including Rijkaard spitting on Völler) between the two players left the Argentine referee with no option but to send them both off. As the players walked off the pitch together, Rijkaard spat on Völler a second time. Early in the second half, Jurgen Klinsmann put the West Germans ahead and Andreas Brehme added a second with eight minutes left. A Ronald Koeman penalty for the Netherlands in the 89th minute narrowed the score to 2–1 but the Germans saw the game out to gain some revenge for their exit to the Dutch in the previous European Championship. Meanwhile, the heroics of Cameroon and Roger Milla continued in their game with Colombia. Milla was introduced as a second-half substitute with the game goalless, eventually breaking the deadlock midway in extra time. Three minutes later he netted a second after Colombian goalkeeper, Rene Higuita was dispossessed by Milla while well out of his goal, leaving the striker free to slot the ball into the empty net. Though the deficit was soon reduced to 2–1, Cameroon held on to become the first African team ever to reach the World Cup quarter-finals. Costa Rica were comfortably beaten 4–1 by Czechoslovakia, for whom Tomas Skuhravy scored the tournament’s second and final hat-trick. The Republic of Ireland’s match with Romania remained goalless after extra time and the Irish side won 5–4 on penalties. David O’Leary converted the penalty that clinched Ireland’s place in the quarter-finals. Ireland thus became the first team since Sweden in 1938 to reach the last eight in a World Cup finals tournament without winning a match outright. Yugoslavia beat Spain 2–1 after extra time, with GDragan Stojkovic scoring both the Yugoslavs’ goals. England were the final qualifier against Belgium, as midfielder David Platt’s’s swivelling volley broke the stalemate with the game moments away from a penalty shoot-out. The first game of the last 8 saw Argentina and a Yugoslav side, reduced to 10 men after only half an hour, play out a goalless stalemate. The holders reached the semi-finals after winning the penalty shoot-out 3–2, despite Maradona having his penalty saved. A second Argentine miss (by Pedro Troglio) looked to have eliminated them until goalkeeper Serfio Goycochea – playing because first choice Nery Pumpido broke his leg during the group stage – rescued his side by stopping the Yugoslavs’ final two spotkicks. The Republic of Ireland’s World Cup run was brought to an end by a single goal from Schillaci in the first half of their quarter-final with hosts Italy. West Germany beat Czechoslovakia with a 25th minute Lothar Mathaus penalty. The quarter-final between England and Cameroon was the only quarter-final to produce more than one goal. Despite Cameroon’s heroics earlier in the tournament, David Platt put England ahead in the 25th minute. At half-time, Milla was brought on. In the second half, the game was turned on its head during a five-minute stretch: first Cameroon were awarded a penalty from which Emmanel Kunde scored the equaliser; then in the 65th minute Eugene Ekeke put Cameroon ahead. Cameroon came within eight minutes of reaching the semi-finals before then they conceded a penalty, which Gary Lineker converted. Midway through extra time, England were awarded another penalty and Lineker again scored from the spot. England were through to the semi-finals for the first time since the days of Bobby Moore 24 years ago. The first semi-final featured the host nation, Italy, and the world champions, Argentina in Naples. 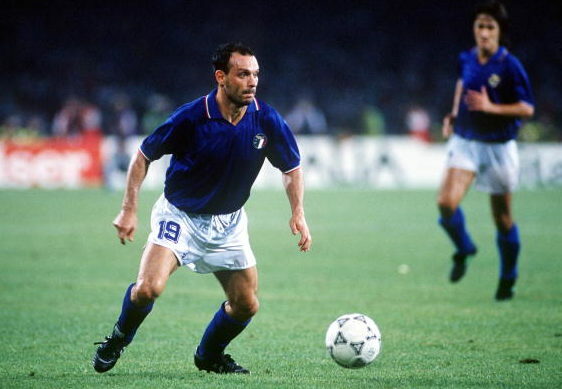 ‘Toto’ Schillaci scored yet again to put Italy ahead in the 17th minute, but Claudio Caniggia equalised midway through the second half, breaking Walter Zenga’s clean sheet streak throughout the tournament. There were no more goals in the 90 minutes or in extra time despite Maradona (who played for Naples in Serie A at the time) showing glimpses of magic, but there was a sending-off: Ricardo Guisti of Argentina was shown the red card in the 13th minute of extra time. Argentina went through on penalties, winning the shoot-out 4–3 after more heroics from Goycochea. The semi-final between West Germany and England at Juventus’s home stadium in Turin was goalless at half-time. Then, in the 60th minute, a shot from Andreas Brehme was deflected by Paul Parker into his own net. England equalised with ten minutes left; Gary Lineker was the scorer. The game ended 1–1. Extra time yielded more chances. Klinsmann was guilty of two glaring misses and both sides struck a post. England had another Platt goal disallowed for offside. 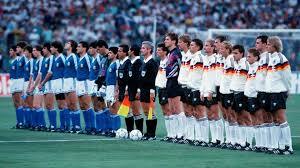 The match went to penalties, and West Germany went on to win the shoot-out 4–3. The game saw three goals in a 15-minute spell. Roberto Baggio opened the scoring after a rare mistake by England’s goalkeeper Peter Shilton, in his final game before international retirement, presented a simple opportunity. A header by David Platt levelled the game 10 minutes later but Schilaci was fouled in the penalty area five minutes later, leading to a penalty. Schillaci himself got up to convert the kick to win him the tournament’s Golden Boot for his six-goal tally. Nicola had a goal ruled out minutes later, but the hosts claimed third place. England had the consolation prize of the Fair Play award, having received no red cards and the lowest average number of yellows per match. The final between West Germany and Argentina has been cited as the most cynical and lowest-quality of all World Cup Finals. In the 65th minute, Argentina’s Pdro Monzon was sent off for a foul on Jurgen Klinsmann, the first player ever to be sent off in a World Cup Final. Argentina, weakened by suspension and injury, offered little attacking threat throughout a contest dominated by the West Germans, who struggled to create many clear goalscoring opportunities. The only goal of the contest arrived in the 85th minute when Mexican referee Edgardo Codesal awarded a Penalty to West Germany, after a foul on Rudi Voller by Roberto Sensini leading to Argentinian protests. Andreas Brehme, converted the spot kick to settle the contest. In the closing moments, Argentina were reduced to nine after Gustavo Dezotti received a red card when he hauled Jurgen Kohler to the ground during a stoppage in play. The 1–0 scoreline provided another first: Argentina were the first team to fail to score in a World Cup Final. 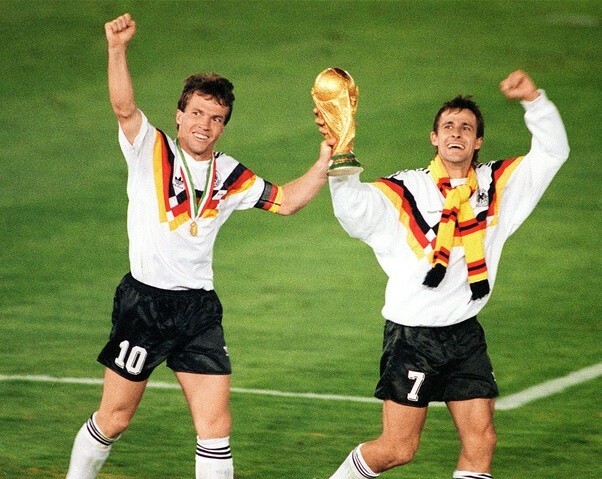 With its third title (and three second-place finishes) West Germany – in its final tournament before national re-unification – became the most successful World Cup nation at the time. West German manager Franz Beckenbauer became the only man to both captain (in 1974) and manage a World Cup winning team, and only the second man (after Mario Zagallo of Brazil) to win the World Cup as a player and as team manager. It was also the first time a team from UEFA won the final against a non-European team. Savlatore Schillaci received the Golden Boot award for scoring six goals in the World Cup. This made him the second Italian footballer to have this honour, after Paolo Rossi won the award in 1982.